Last week on All American, Spencer and Jordan went through a competitive recruiting event with players from South Crenshaw. Both of them had competition that made them question their own abilities, while Spencer also saw the seedy underbelly of College Boosters. Elsewhere, Olivia came to Asher’s aid and hooked him up with a living situation inside Layla giant, empty house. Now, on to tonight’s all new All American … BEWARE OF SPOILERS! This is the time of the year when all the networks makes their pilgrimage to the Television Critics Association Winter Press Tour in Pasadena, California. Yesterday, it was The CW’s turn to give us the lowdown on things to come (all of the CBS-related network went I, believe) and we got some very interesting news. Last week, we laid Shawn to rest while Spencer realized the important of being a hope for his community; to keep one foot in Crenshaw and one foot in Beverly Hills. Catch up on all of the action from last week with our deep dive recap and review here. Now, on to Episode 10 of All American, “m.A.A.d. City” … BEWARE OF SPOILERS! To refresh your memory from the Winter finale, Spencer and the Beverly Eagles won the big Homecoming game against those cheaters at Malibu but elsewhere, things were falling apart. Shawn bought his way out of the gang life only to be shot and killed as we was getting ready to celebrate with Coop. Jordan was lured into taking drugs by the hot Malibu cheerleader only to be put on the carpet for a drug test after the game. The episode ended with Coach Baker switching out his son’s urine sample. Ruh Roh. Problems on problems. Catch up on the entire recap of the last episode here. 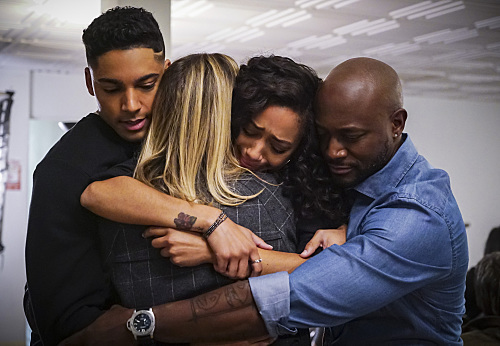 Now, on to the deep dive recap and review of tonight’s all new All American, “Keep Ya Head Up” … BEWARE OF SPOILERS! Yesterday, The CW announced its lineup for Spring 2019, including all of its premiere and finale dates for its shows. It also gave a synopsis of its newest show, In the Dark. All the dates and schedule changes you need to know … after the jump! 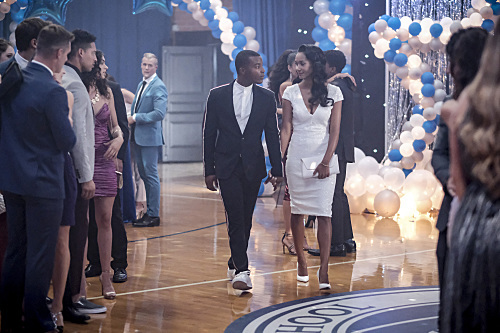 After last week’s disastrous Homecoming dance, tonight’s mid-season finale of All American is full of ramifications for everyone and their season long choices! Catch up on all of last week’s action with our recap here! 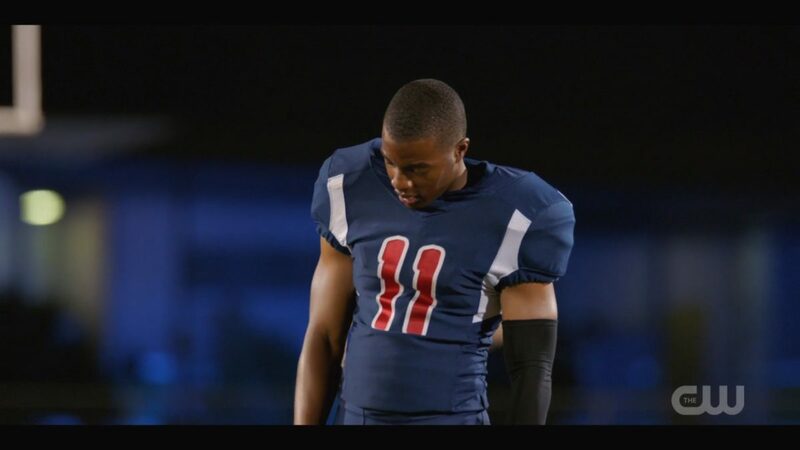 Now, the mid-season finale of All American, “Homecoming” … after the jump! BEWARE SPOILERS!! The last episode of All American featured a Crenshaw block party complete with Chris hitting on Olivia, Shawn shooting a rival gang member dead, and Layla meeting the new love of her father’s life. And it ended with Spencer and Layla finally sharing a kiss he’s been chasing for a while (and of course, Olivia seeing said kiss). Read the entire recap here! On to tonight’s episode which takes place over the course of just a few hours, the night before the big game against Malibu. BEWARE SPOILERS … after the jump! The last new episode of All American ended with Layla’s dad returning to town with a new woman, Chynna, joining him, and Olivia telling Jordan about how she slept with Asher. 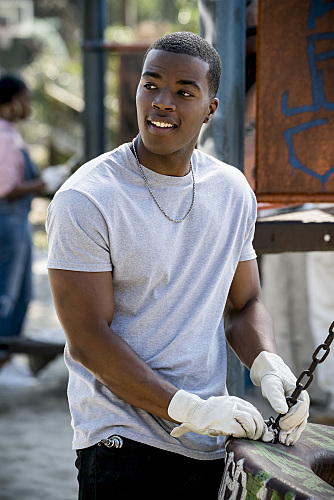 In Crenshaw, Coop was falling in more and more with Shawn’s gang and Spencer was seemingly powerless to stop it. Catch up on all of last episode’s action with our recap here. Now, tonight’s episode (BEWARE OF SPOILERS)!!! If you aren’t caught up on The Outpost, you can read my latest recap here. SPOILERS AHEAD for tonight’s season finale! Each and every week, we watch and recap all of the Arrowverse show so you don’t have to! We break them down for you and let you know what’s going on … Across the Arrowverse! Catch up on last week’s action here! This week didn’t have a lot of crossover material but with Elseworlds coming in less than two weeks, your crossover life is about to get real.